We have created a major exhibition here online. After reading this page please CLICK HERE. In the 18th and 19th centuries Prestonpans was the pre-eminent manufacturer of pottery in Scotland under the leadership of the Cadells, Gordons and Watsons. It was the town's major employer. These traditions continued with Charles Belfield & Sons right up until the 1930s, and lived again in the late 20th century with Dorothy Clyde at Pyper's Wynd. Since the inception of the Arts Festival in 1997 we have sought to conserve and honour this first great flowering of the arts in Prestonpans. We have also made selective reproductions and captured a virtual exhibition here on this website. But 2007 was identified as a defining year for the Arts Festival truly to honour the town's pottery legacy and heritage. Graeme Cruikshank was appointed Curator for both a Road Show in March 2007 and for the most substantial Exhibition ever given in September 2007. At the same time, Graeme Cruickshank was invited to write and extensively illustrate a definitive history of Prestonpans Pottery for publication by the Arts Festival in association with Burke's Peerage & Gentry. This he has now done, with Linda Sneddon as Principal Photographer. It is an awesome work of great scholarship. The Pottery Road Show took place at The Prestoungrange Gothenburg, High Street, Prestonpans on Saturday March 3rd & Sunday March 4th 2007 and was a triumph with more than 100 significant pieces being brought in for valuation and consideration. 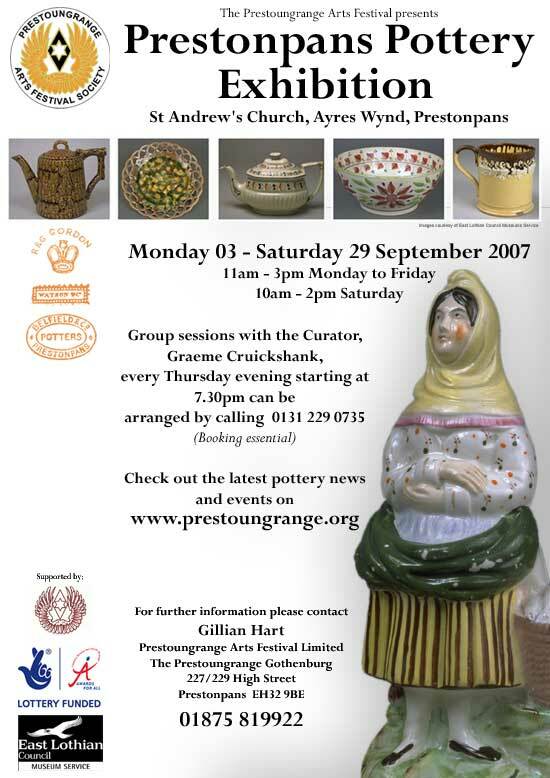 After 3 years research and writing with the Arts Festival, Graeme Cruickshank presents what is the 'definitive' exhibition to date of Prestonpans Pottery at St Andrew's Episcopal Church, Ayres Wynd, Prestonpans from September 3rd - 29th 2007. The poster below indicates the full details for visitors. You can CLICK HERE to review the book Presonpans Pottery and order online if you so wish. A listing of the exhibits cross referenced to the new book is available gratis for visitors and a series of seminars and events is scheduled. The Exhibition will conclude with a Greek Plate Throwing Banquet [courtesy of Sam Burns Yard] at the site of the old Belfield Pottery i.e. The Prestoungrange Gothenburg Car Park, sponsored by The Prestoungrange Gothenburg. Most recently The Prestoungrange Gothenburg has ensured that afternoon tea is provided from traditional Prestonpans 'Belfield' which has been faithfully recreated. These teapots, milk jugs and bowls also available for sale at The Prestoungrange Gothenburg and the Boutique online. The 'new' Wiles bus livery has also been captured as a Novelty Teapot by Tony Carter and is for sale.